– The pot must have a base made of a material such as ferritic stainless steel, 18/10 stainless steel, iron, cast iron, suitable to absorb magnetic waves. Now, when the pot is placed on the switched-on induction hob, a contact is created that, through the force of the magnetic field induced by the coils, some circular currents are induced to cause, according to Foucault’s law, an immediate heating of the pot’s base while the plate stays cold; this latter only becomes warm indirectly in consequent time. The demands of modern society, more and more projected toward the future and toward products that are technologically innovative and capable to ensure energy savings at the same efficiency level, has led our company to improve the concept of cooking by induction. After thorough studies and major investments in technology, our company developed an extremely innovative, patented method, held on a world-wide exclusive basis. The introduction of a special “carved motif” on the base, besides the advantage of an immediate esthetic identification, has a specific function. It has been technically demonstrated that the inclusion of some non-magnetic steel “barriers” on the surface of the pot’s base stimulates a greater molecular movement, thus increasing the performance of the electromagnetic field and thereby increasing the heating power. In our pots, the “barriers” are provided by our exclusive, patented “carved motif”. 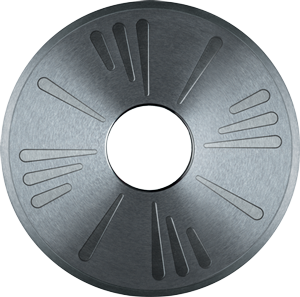 Another distinctive element of our special bottom is that the parts of material that emerge from the carvings on the disk of magnetizable material are Always covered with the prestigious AISI 304 stainless steel. One main advantage is preventing corrosion of the bases and alteration of their esthetic appearance, as well as ensuring the perfect flatness and adherence of the base to the hob’s surface, with obvious advantages in terms of cooking’s speed and energy savings. All this without losing any of the advantages of high-performing cooking on any other heat source (gas, halogen, electric, vitro-ceramic).